This PCI Express 6 pin to 8 pin power adapter cable lets you connect a standard 6-pin PCI Express power connection provided by the computer power supply to newer ATI and NVidia video cards that require an 8 pin power connection.The PCIe 6 pin to 8 pin power adapter eliminates the expense of upgrading a computer power supply for the sake of compatibility with a newer video card. 1.High quality 6 pin to 2 x PCIe 8 (6+2) pin graphics card PCI-e Express VGA splitter power extension cable. 2.Provides an option for connecting a power supply without an 8 pin PCIe connection for GPU power. 3.Eliminates the expense of upgrading a computer power supply for the sake of compatibility with dual video card systems.ense of upgrading a computer power supply for the sake of compatibility with dual video card systems. 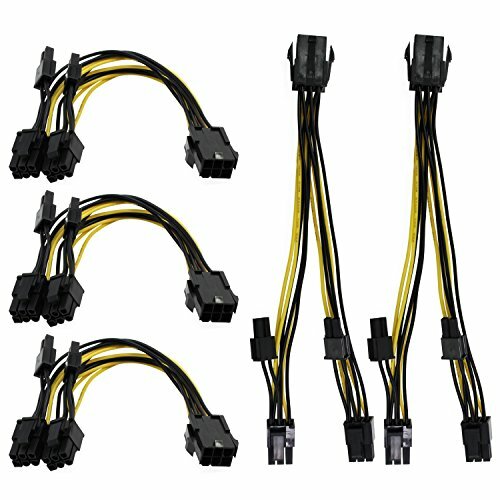 4.8 PIN PCIe to 6 PIN male to female adapter cable provides a convenient solution for supplying video graphics card power with an 8 pin connector for GPU cards that require more power. 5.Convenient solution for adding two extra PCI Express connectors to your existing power supply. If you have any questions about this product by Aike®, contact us by completing and submitting the form below. If you are looking for a specif part number, please include it with your message.